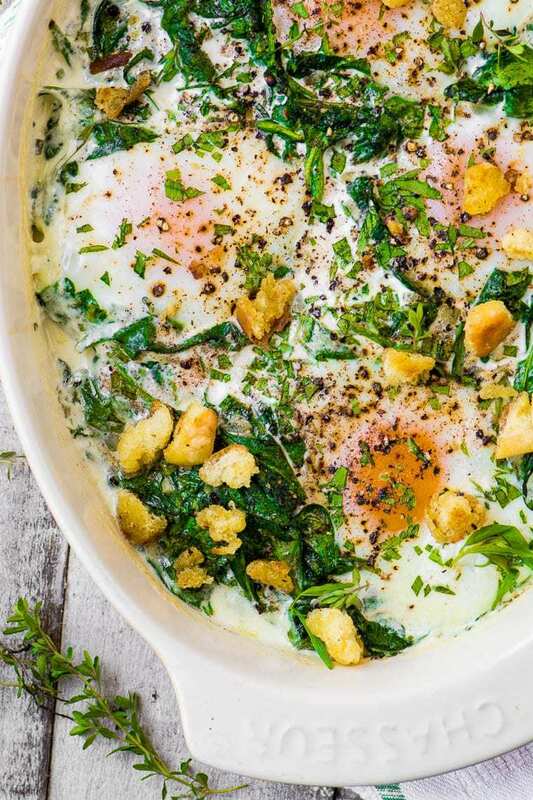 Baked Eggs Florentine ~ a simple but delicious dish of baked eggs with spinach. It makes an elegant breakfast, brunch, or cozy dinner. Add a tablespoon of oil to a skillet and stir fry the bread crumbs for about 10 minutes until they are browned and crispy. Hit them with a little salt and pepper, and add the thyme. Set aside. Heat the remaining oil in the skillet and saute the garlic and shallot for a couple of minutes, stirring constantly. Add the spinach and stir until it wilts. Season with a pinch of salt. Put the spinach in the bottom of a gratin dish. Make four little indents for the eggs, and space them evenly around the dish. Crack an egg into each indent. Pour the cream around the eggs, and top with the tarragon. Sprinkle with salt and fresh cracked black pepper. Finish with a dusting of fresh nutmeg. Bake for 15 minutes, or until the whites are just set but the yolks are runny. Top with the breadcrumbs and more fresh herbs, if you like. Serve immediately.